[2012 Feb] Nikola Tesla was Murdered by Otto Skorzeny Bermen heard from Skorzeny that he had personally suffocated Nikola Tesla on January 6, 1943, assisted by fellow-Nazi Reinhard Gehlen. Tesla was then 86 years old. According to Skorzeny, he and Gehlen had tricked Tesla the previous day into revealing the full details of his most important discoveries. After the murder, they stole the contents of Tesla’s safe, which were delivered to Hitler. (Note, of course, that the US military would have fully repatriated this treasure trove of innovation through Project Paperclip at the end of the war. ).......Tesla had begun construction of a wireless power transmission tower (“Wardenclyffe,” Shoreham, Long Island) with funds invested by J.P. Morgan. When Morgan discovered that the tower would transmit free electricity and radio waves, he cancelled the project and had the tower dismantled, then sold for scrap. Morgan was not about to allow Americans to receive free electricity, television and radio. JP Morgan yells in anger at photographers. Hitler’s main source of economic power was from the I.G. Farben chemical cartel, and I.G. Farben in turn was controlled by the Illuminati. The I.G. Farben cartel was created by loans from Wall Street in what has been called the Dawes plan. Carroll Quigley calls the Dawes Plan "largely a J.P. Morgan production." 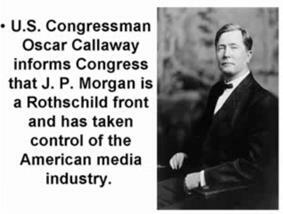 The J.P. Morgan Group set up the loan to I.G. Farben, which created Hitler. 'Without the capital supplied by Wall Street, there would have been no I.G. Farben in the first place, and almost certainly no Adolf Hitler and World War II." Henry Ford merged his German assets with I.G. Farben in 1928. The cartel created the lethal Zyklon B gas that was used to exterminate the Jews. It was also involved in the torture experimentations that led to mind control methods, such as Monarch Programming. Do you see what happened? A Rothschild agent set up a cartel that was directly involved in the horrible persecution of the Jews. Still the family maintains the illusion of being totally supportive of their race. At first Germany had a significant disadvantage if they were to embark on a second world war. The nation had a fuel shortage, but the Illuminati fixed this problem. The Germans were able to fight WWII through the use of synthetic fuels that were created by the hydrogenation process (turning coal into gasoline). This process was discovered by I.G. Farben. Hydrogenation technology would not have been fully developed by WWII, but I.G. Farben made a deal with Rockefeller’s Standard Oil, who was able to complete the research, facilitating the war. Interestingly, I.G. Farben plants were not targeted by the bombing raids on Germany. By the end of the war the refineries had experienced only 15% damage. William Dodd, American ambassador to Germany before WWII, wrote President Roosevelt: "At the present moment, more than a hundred American corporations have subsidiaries here or cooperative understandings. 'The DuPonts have their allies in Germany that are aiding in the armament business. Their chief ally is the I.G. Farben Company... 'Standard Oil Company ... sent $2,000,000 here in December, 1933 and has made $500,000 a year helping Germans improve hydrogenation technology] ... ,,The International Harvester Company president told me their business here rose 33% year, but they could take nothing [earnings] out [except in goods]. ‘Even our airplanes people have secret arrangements with Krupps. ‘General Motors Company [which was controlled by the J.P. Morgan Group] and Ford do enormous business here through their subsidiaries and take no profits out." Germany needed the capital of these, and many more American companies in order to wage a war. I.G. Farben had a holding company in the United States called American I.G. Farben. Paul Warburg, his brother Max (head of Germanys secret police during WWI), and Warburg agent Herman Metz were some of the members of the board of directors of the American I.G. Farben. Other directors included Rockefeller/International banking men (Edsel Ford, Charies Mitchell, Walter Teagle, etc) . Three Germans on the Board of Governors were convicted as war criminals after the war, but the elite Americans fore-mentioned were not, even though they participated in the same criminal decisions as those who were punished. According to author Eustice Mullins, Hitier met with Allen and John Foster Dulles in 1933.